EASY Halloween Pumpkin Cookie Cake – the most fun Halloween treat! 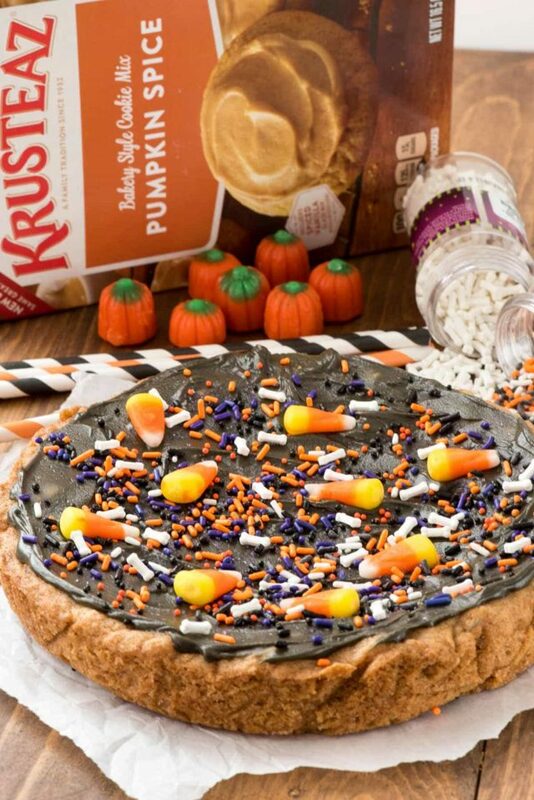 Thanks to a Krusteaz Pumpkin Cookie mix this recipe is made in minutes and all you need are some Halloween sprinkles to make it your kids new favorite dessert recipe. I just spent my third Saturday night in a row celebrating birthdays for friends. Two of the three parties were hosted by me and I made desserts for all of them. Basically, I woke up Sunday morning and realized the first week of October is already gone and I haven’t spent even a minute thinking about Halloween. I haven’t made any cute Halloween treats or decorated my house. Jordan doesn’t have a costume yet and we haven’t gone to the pumpkin patch. It’s still early October but I already feel like I’m failing fall. Does anyone else feel that way? Fall is my favorite season but every year it seems to get harder to actually enjoy it. I am going to do my best over the next few weeks to soak in the changing leaves and all things pumpkin spice. What’s on your October bucket list this year? Honestly, if I manage to get Jordan a Halloween costume I think I’ll win the month. Also, I managed to eek out a Halloween treat so pretty much I’m winning at this week. And, it’s pumpkin flavored. Two birds with one stone! 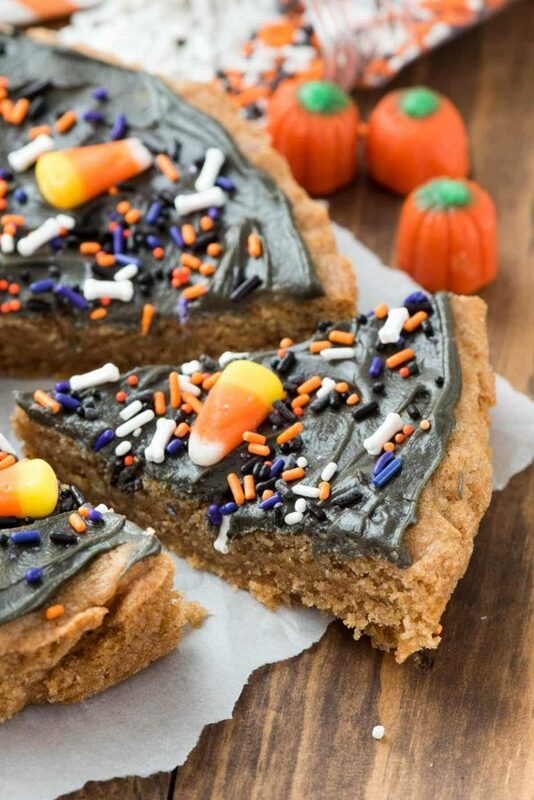 This easy Halloween Pumpkin Cookie Cake is super flavorful and starts with a mix. Some simple black food coloring and sprinkles and it turns into a sweet and a little scary Halloween treat! I have a thing for cookie cakes. I love making them for holidays like Easter or Fourth of July, and I always make one for football parties. I’ve got Valentine’s Day, Christmas and Thanksgiving covered, so it was about time to make an easy cookie cake for Halloween. Since Halloween is the start of pumpkin season, I decided to go one step further and make this a PUMPKIN Cookie Cake decorated for Halloween with black frosting and tons of fun sprinkles. 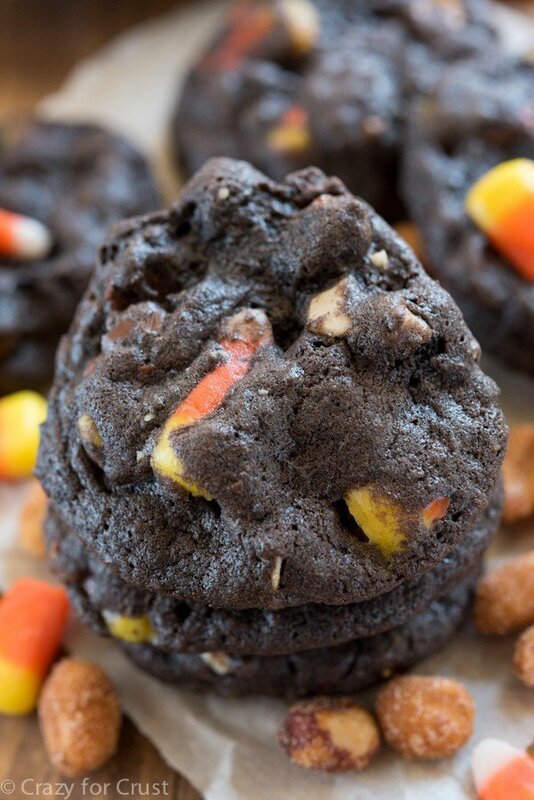 I started this recipe with the Krusteaz Pumpkin Spice Cookie Mix. It’s super flavorful and the pumpkin spice jumps out at your nose first and then you get it on your tastebuds. It’s hard to eat just one slice! The mix makes great cookies, but the cookie cake is even better. It stays soft and gooey in the center, just how I like it. Since the cookie mix comes with a frosting packet, it’s even easier to decorate. I tinted my frosting black but you could do a bright green or purple, or just skip the food coloring and add the fun sprinkles. However you decorate it, this Halloween Pumpkin Cookie Cake is the perfect dessert for any party because it’s easy, starts with a mix, and has the perfect fall taste. Feel free to add chocolate chips to the cookie recipe. Pumpkin goes so well with chocolate or white chocolate, after all. Use foil for easy removal from the pan. Just a few drops of black food coloring turns the frosting a scary black! Use any sprinkles you have. The holiday aisles have all the fun sprinkles out now. This would also be cute for Christmas. 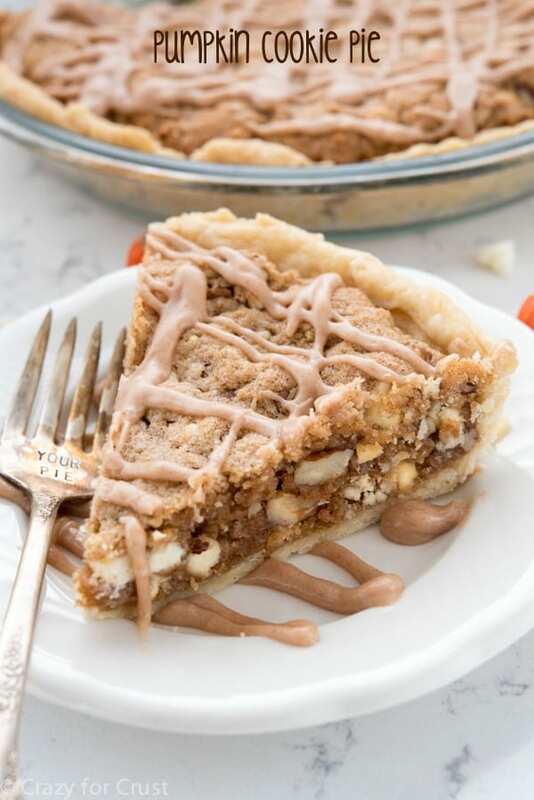 You can also find this recipe on the Krusteaz website. EASY Halloween Pumpkin Cookie Cake - the most fun Halloween treat! 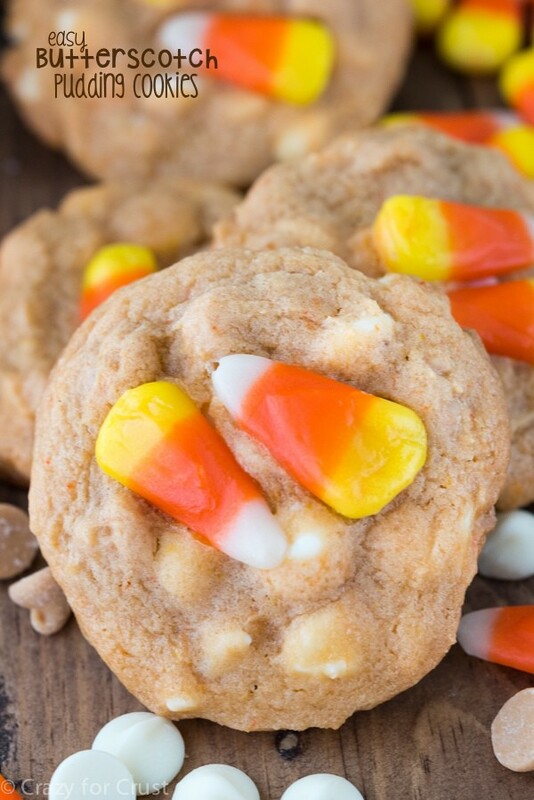 Thanks to a Krusteaz Pumpkin Cookie mix this recipe is made in minutes and all you need are some Halloween sprinkles to make it your kids new favorite dessert recipe. Preheat griddle to 350°F. Line an 8” or 9” round pan with foil and spray with nonstick cooking spray. Stir or mix the cookie mix with the butter and egg until a thick cookie dough forms. Press into prepared pan. Bake for 22-26 minutes, or until browned around the edges and no longer shiny on top. Cool completely before frostijng. Whisk icing packet and water until icing forms desired consistency. Add 4-6 drops of black food coloring and stir to distribute color. 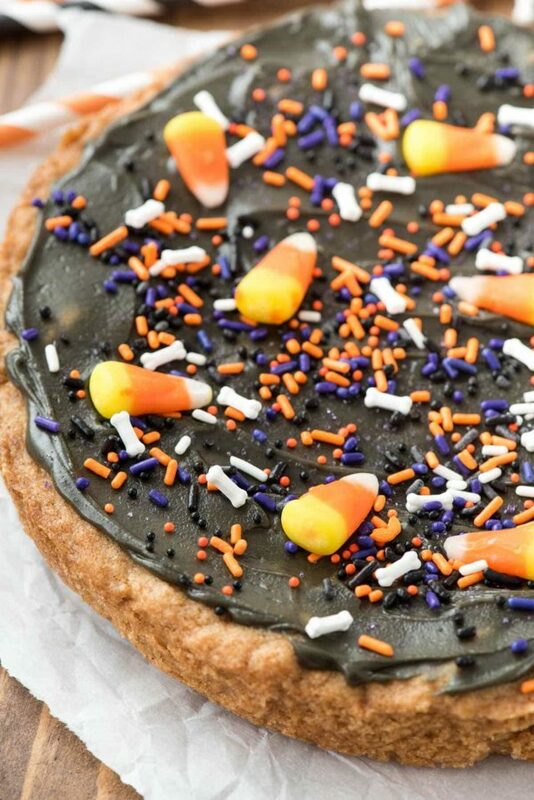 Frost the cookie cake and then top with Halloween sprinkles. And this cake, so fun for Halloween and what a great use of the mix! You are the birthday queen. I feel like every since your bday, it’s been one big bday celebration because I keep seeing all the bday pics! You are the best friend ever to host AND cook/bake desserts for their parties! Dorothy, what a great recipe! Will make this for Halloween. Can’t wait! Wow, you’ve been busy. Only 3 weeks until Halloween; Jordan should be decorating. Love the cookie cake. Well, this is obviously necessary for life to continue. 🙂 Love this festive halloween cookie-cake, Dorothy!